Thanks for your interest in Dailey Travel. company. Our mission is to enhance your travel experience with Chinese, Asian and American cultures, and to increase your business success in China. Our value is to search for ways to save time and money for our customers, and to provide valuable connections and build fruitful relationships for our business clients. Our business specializes in three main services: China vacation, education and business consultation. 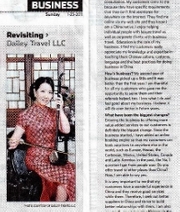 Sunday January 23, 2011 Pioneer Press featured "Revisiting Dailey Travel LLC" with questions such as: What does your business do? How's business? What have been the biggest changes? Do you have any advice for others launching a business? Click here to read the article. Sunday November 21, 2010 Star Tribune featured Katie Dailey with Dailey Travel LLC on its “Free business counseling opens doors for travel startup”. It reads: A sticker on the front-door window of Katie Dailey's Woodbury home proudly announces that she is a member of the city's Chamber of Commerce. 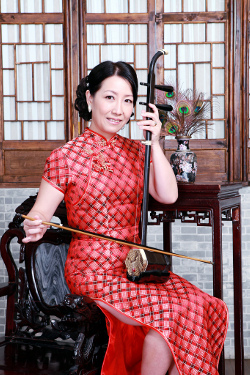 At her home, she runs a thriving travel agency planning trips for business and leisure travelers to her native China...Click here to read the article. Sunday November 22, 2009 Pioneer Press featured Dailey Travel LLC on its “Open for Business”. Read the article here. January 13, 2010 Woodbury Bulletin featured “A business venture with cultural roots”. 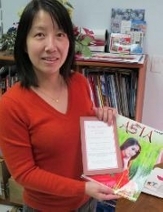 It reads: Local woman founds travel business with focus on China...Click here to read the article. 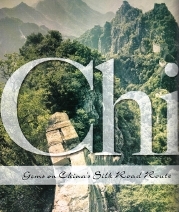 Do you know that World Trade Organization predicts China will be #1 travel destination by 2020? Katie is excited to join other travel professionals to make that happen by helping you achieve your goals.